This classic tahini-based hummus is paired with homemade parmesan pita chips for a great party appetizer or afternoon snack! As a food blogger, I spend a lot of time thinking about creative ideas for new recipes that will eventually become blog posts. Then sometimes, when I’m in the kitchen just cooking “regular” stuff, I realize I should share some of those recipes with you too! They are often the things I make every week, and in some cases, I’ve been making them for many years. They are usually great, quick and easy recipes. This is a great, and super tasty, example of one of these recipes. I used to only make hummus on “special” occasions, as it just seemed so much easier to buy it, however, if you think about it, hummus is really such an easy thing to make. Just a couple of ingredients, a food processor, and in a few minutes you have a tasty, healthy snack! 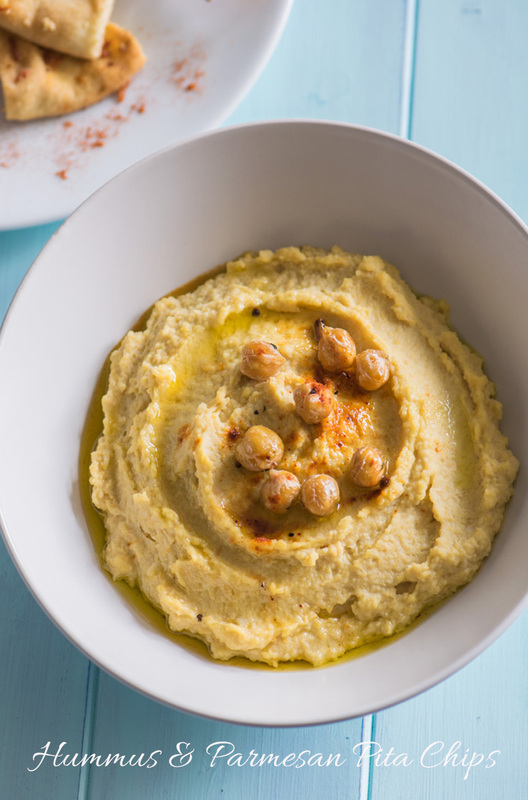 I think homemade hummus tastes so much better too, and you can control the seasonings to your liking – a little more garlic, a little less lemon – whatever you happen to prefer. Same with the pita chips, mix the chips up with a few seasonings of your choice and bake until crisp – I promise they are much better than anything you purchase in the store! I first published this recipe on National Hummus Day (May 13th). Did you even know there was such a day?! I’d never heard of it before but if you check out Twitter and Instagram for the hashtag #hummusday, you’ll find a lot of people who have. So, it seemed like an appropriate day for a post about my favorite hummus and parmesan pita chips. Enjoy!! Place garlic in a food processor and pulse until minced. Add the beans, salt, lemon juice and tahini; pulse several times. With the motor running, slowly pour in the olive oil, stopping at 3 tablespoons to check the consistency. Add additional oil if you prefer a thinner hummus. Continue processing until mixture is smooth. Preheat the oven to 375 degrees and line a jelly roll pan with parchment paper. Cut the pita rounds into triangles and place in a large bowl. Add remaining ingredients and toss until the pita bread is well coated. Spread in a single layer on the jelly roll pan and cook for 12-15 minutes, or until golden brown and crisp. Cool until ready to serve. Chips will keep in an airtight container for about a week. Updated. Originally published May 2015. Hummus is always a winner! Looks fantastic! Hummus and pita chips are of my favorite snacks. I’ll often pair them with a bunch of fresh cut vegetables and call it a meal! I really like the idea of making pita chips, too! I’ve never tried to make my own pita chips before! I bet these are crunchy and delicious! This recipe seems so easy and sounds delicious! Going to try it!